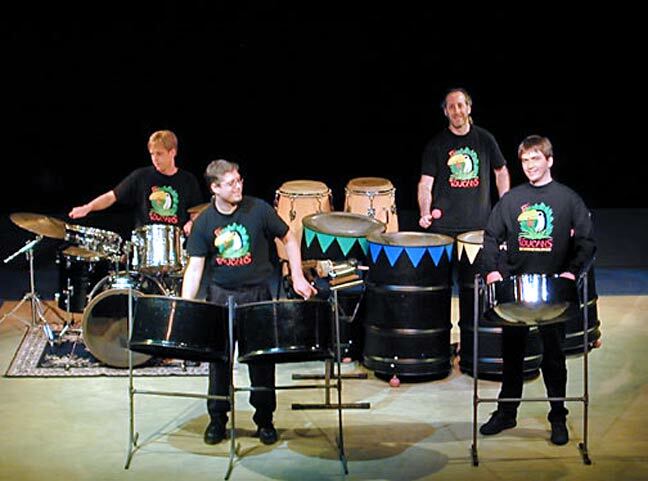 The Toucans have been thrilling Pacific Northwest audiences with our tropical steel band rhythms since 1988. 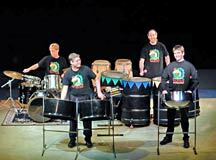 Our dynamic 4-person group features all-acoustic Steel Drums and a small drum kit. We play Caribbean calypso music, Jamaican reggae, and popular tunes, standards & favorites as well. We've performed just about everywhere: at outdoor concerts, picnics & barbeques; for wedding receptions, family reunions & birthday parties and school shows; and don't forget holiday parties, silent auctions and corporate events, both fun and formal. The Toucans consistently rate at the top of the list in client satisfaction! "We enjoyed your music so much! My husband, who saw no reason to have a band at all, thought you were the best thing about the wedding. Your music is wonderful!" Snappy, danceable arrangements and our easy-to-work-with style make the Toucans one of Seattle's most popular groups. Responsive, exciting & professional; you can always count on the Toucans for a memorable musical experience! If you have a date & time in mind for your event, please do let us know! For more information, browse through the rest of our Booking Page Section, or jump directly to the Detail Page. Make The Toucans A Great Part Of Your Next Event!